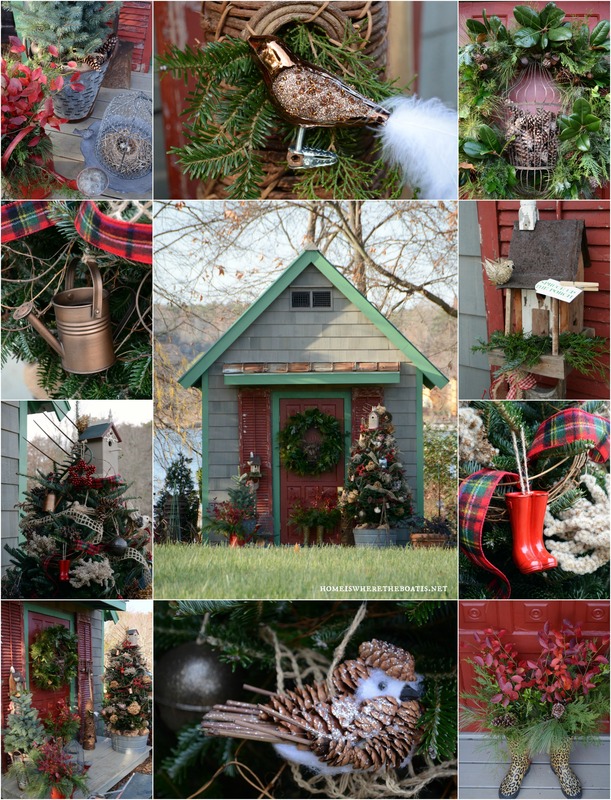 I’m Sprucing Up the Porch of my Potting Shed and counting the down the days until Christmas with the help of my Birds of a Feather Advent Calendar! I started with the back porch of my Potting Shed, since ‘sprucing up the porch’ has been on my ‘to do’ list since her move, with her once hidden back door now visible and embarrassingly naked. I found a pair of tall chippy, distressed red shutters to flank the back door at a favorite antique mall this fall. 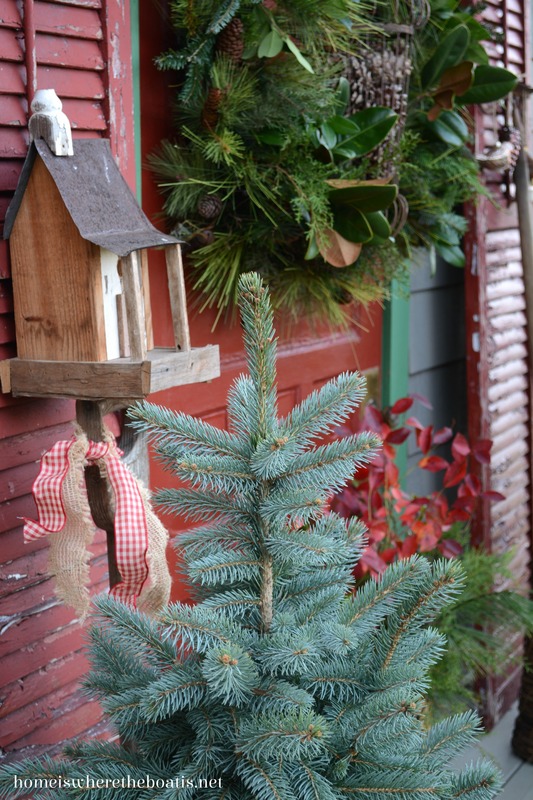 Adding a little greenery goes a long way towards holiday decorating when you have access to some pine, cedar and magnolia for decking the halls! Hanging a wreath on the back door was the first step and Day 1 of my advent calendar. I started with an artificial wreath and added some fresh magnolia, cypress, cedar and fir to soften and add a natural element. 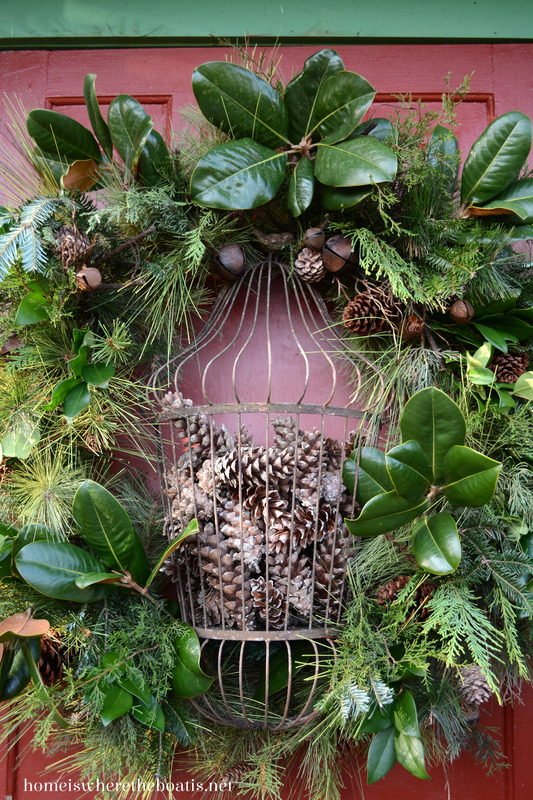 The wreath is framing a decorative metal half bird cage and home to some pine cones for the season. 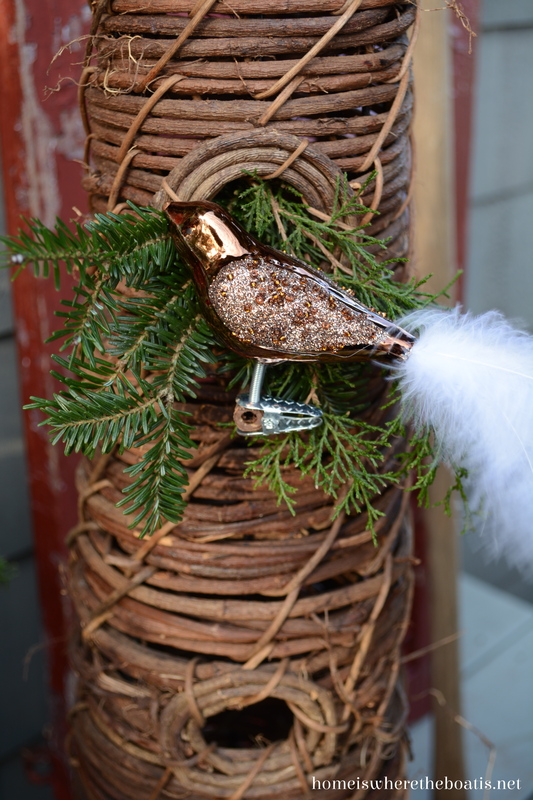 Clip-on bird ornaments flew in to spruce up the porch. . .
And more ornaments are hanging on a vintage rake. 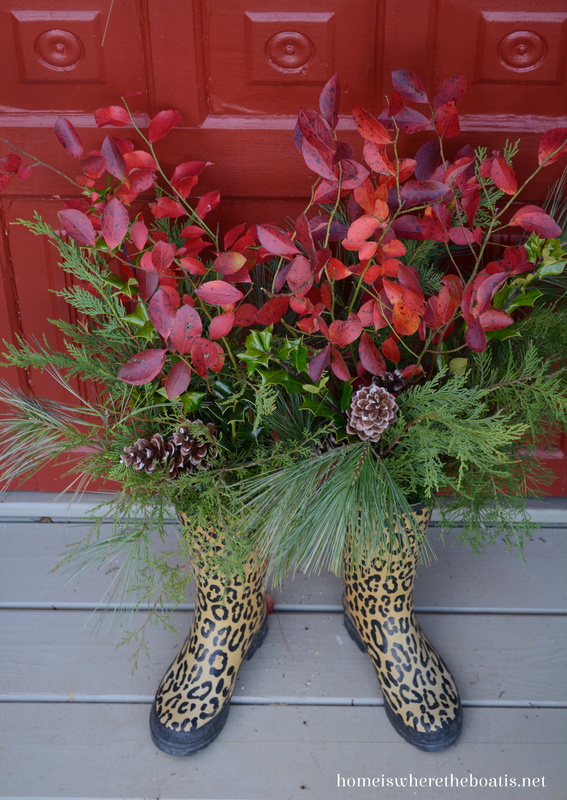 Wellies are filled with greenery, pine cones, and red leaves blazing with the last bit of fleeting fall color. I trimmed a tree with assorted garden ornaments, grapevine and ribbon. 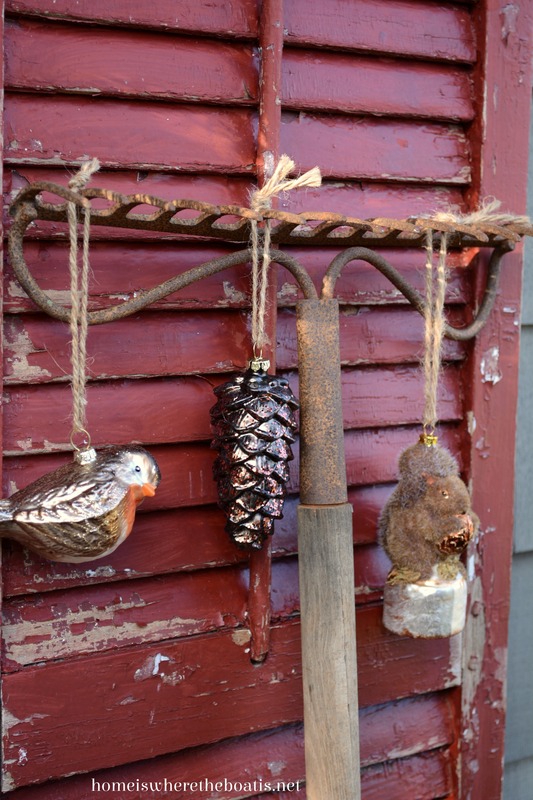 Assorted salvaged tools~ a rake, pitch fork and hand fork, join a bird house and nest as a tree topper. 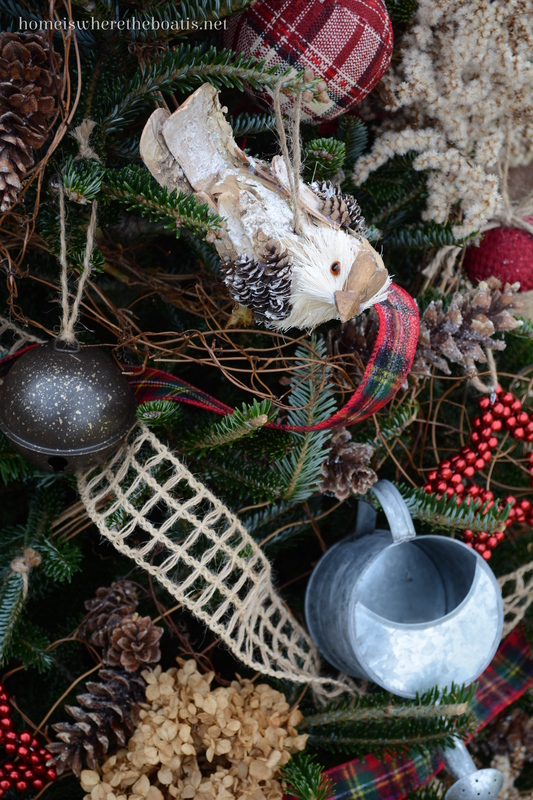 Jute-wrapped and pine cone-covered birds are nesting in the tree with watering cans and wellies. . .
And goldenrod gone to seed and dried hydrangeas provide some soft texture and filler. 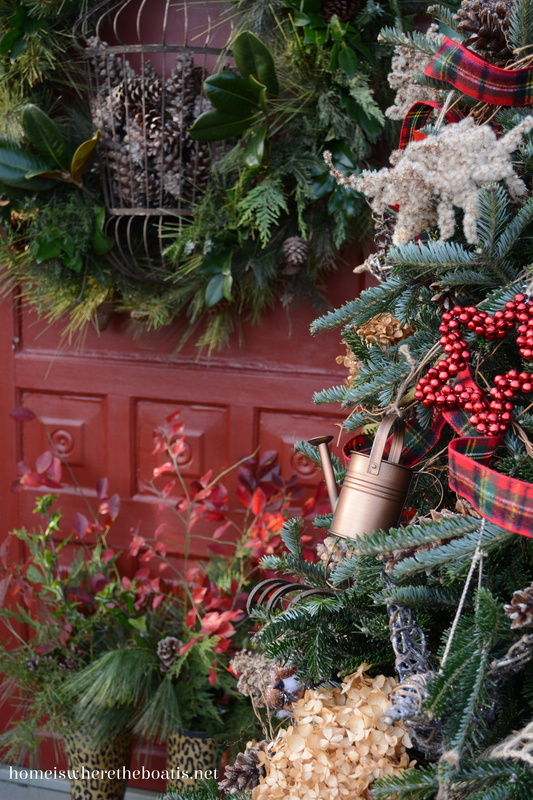 Tartan ribbon and plaid ornaments add a bright punch of cheery color. Hope you’re enjoying trimming your tree and sprucing your porch! 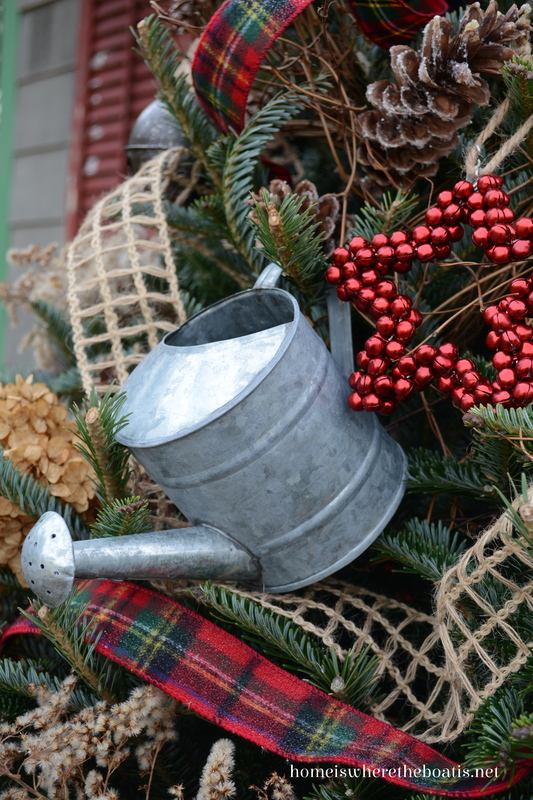 You have decorated your potting shed just adorably! I love the wreath with the half a bird cage, that is my favorite thing! You always do such a great job! Loving your decorating talents!👏 Have a great weekend! It looks wonderful, you did a tremendous job! 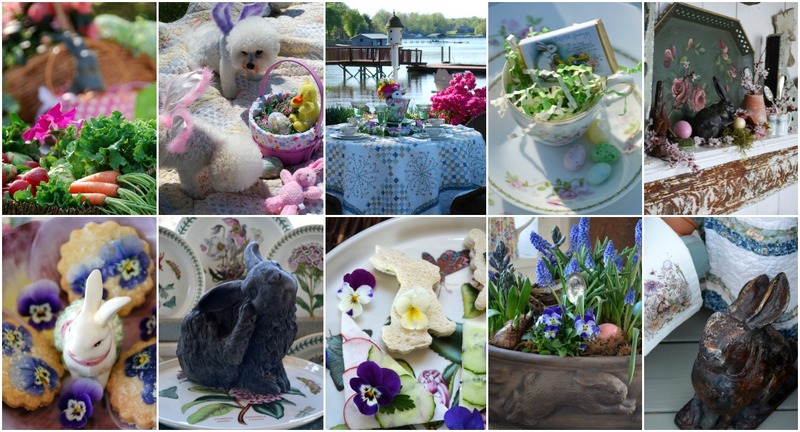 I LOVE what you have done with the wreath & wire basket–inspired! Oh Christmas Tree! 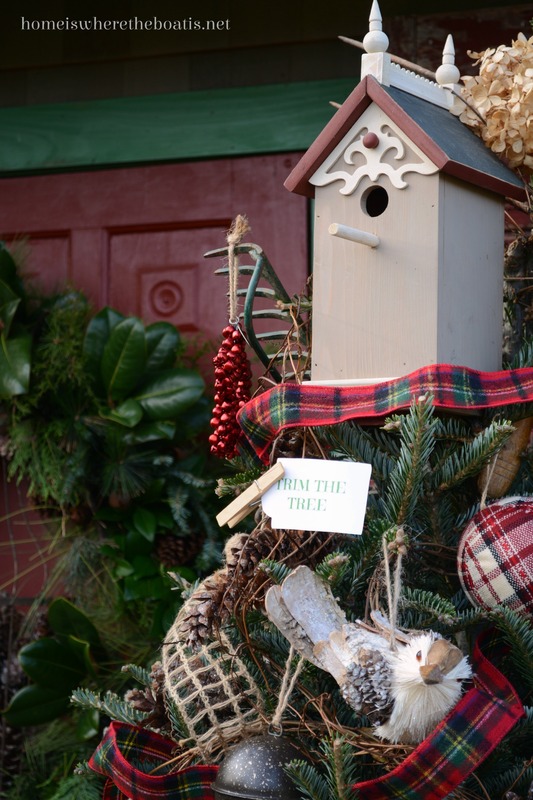 From the bird house and tool topper down through the branches adorned with pine cone birds and red garden boots, you’ve added all the right touches for your potting shed tree! 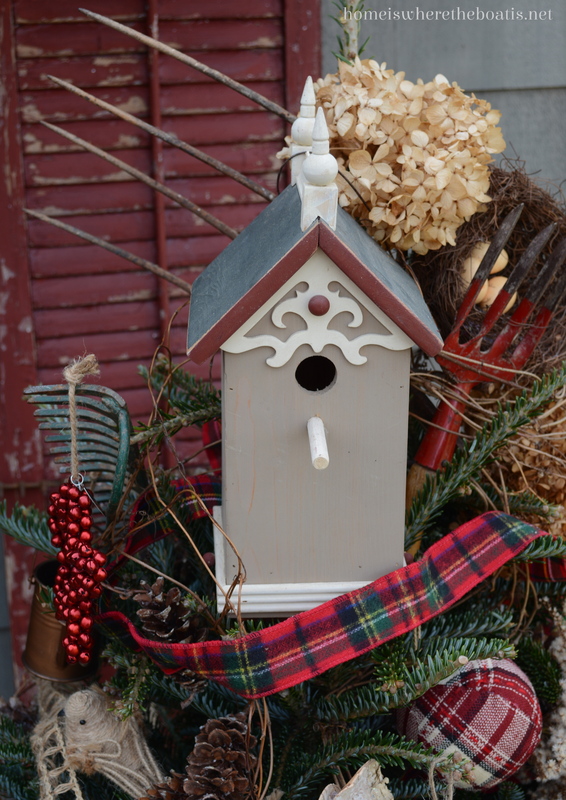 It looks so cute in the big bucket by your chippy red shutters! I would have never guessed you used an artificial wreath as the base for the one on your door, adding those natural elements makes the whole thing look so natural~great idea! As usual, I could stay here all day spotting all the wonderful details and surprises! :) Love the clip on bird ornaments! Mary, I always love seeing your seasonal decor at your shed. Well, done again! Love, Love, Love this! Beautiful as always! Stunning as usual! Your back porch (and door) looks better than most front porches I’ve seen… just sayin!! 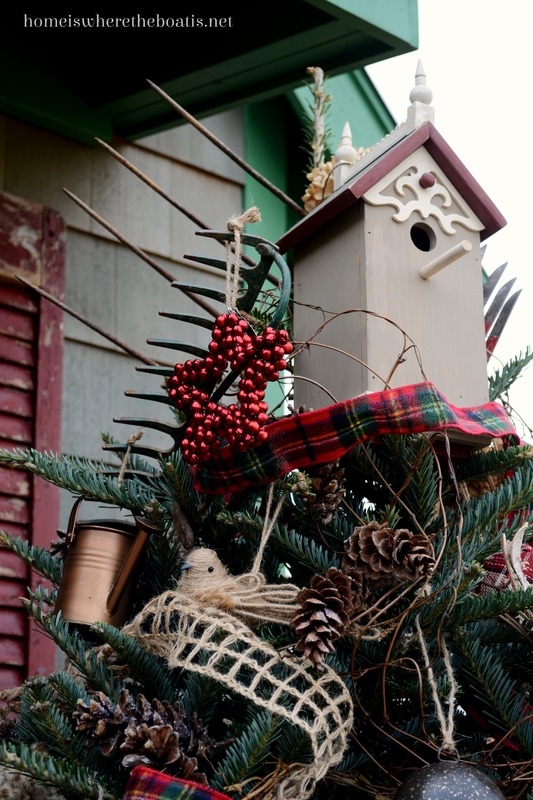 I love the wreath with the pinecones in the birdcage….what a great idea. I wish I had your knack for decorating. The holidays are such a fun time and your ideas make my day brighter…thanks for sharing them with us. Oh Mary, I want to move right into the potting shed! It’s like a little dream cottage to me. the wreath doesn’t even look artificial with your natural elements added. 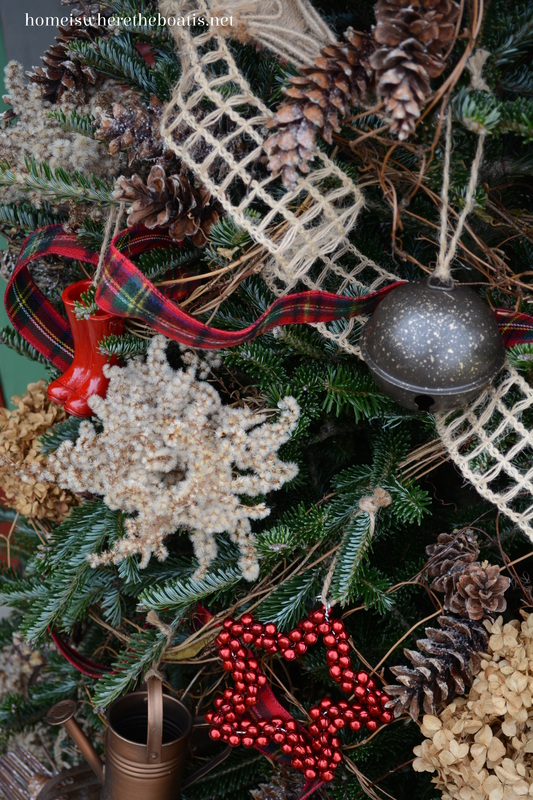 I love the iron piece hanging in the middle with the pine cones. The tree is perfectly adorned. You must have so much fun playing at your potting shed. LOVE!! the magnolia and pine wreath ~ it is all lovely! Mary I love the falling snow. So fun! oh your boot ornament, pitter patter! dang girl this is so fun for me, now please PIN EVERY SINGLE PIC so i can steal them for the birds of feather advent board, i adore caging all your fun in one place! Looks gorgeous! Every year I tell myself I’m going to decorate our tea room (former greenhouse) and I just never seem to get to it. I would copycat a lot of your ideas! Charming in every way! You always know how to incorporate just the right “pop” for an interesting vignette. I have gotten so many great ideas from your blog and do appreciate all the effort involved to bring fun to my days….sending a big hug. 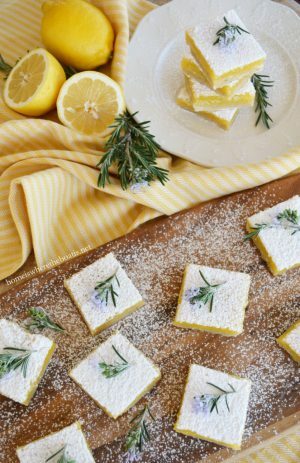 I, too, have done the fresh- added- to- faux wreaths….a dear friend turned me on to that little trick many years ago and it has made wreath making so much easier. Have a great day! 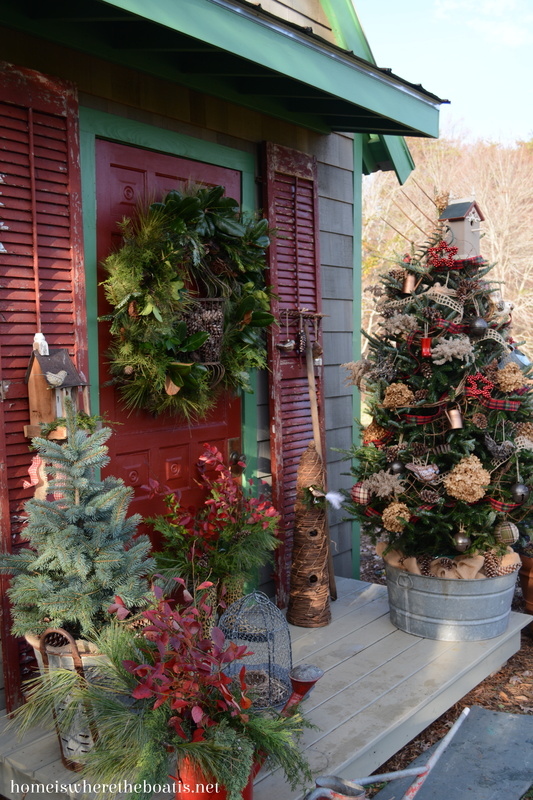 Woooos and awwwwws , coming your way , Love the potting shed all decked out for Christmas, she is looking so lovely !! Thanks for sharing all your talents Mary ! You knock my socks off once again! My favorites are the wreath around the bird cage and the wellies ornament!!!!!! SA WEET!!!!! Every element is perfection! This is exactly why I wish we had milder weather and I could decorate like this!!! Gorgeous my friend!!! Have a beautiful weekend. Just finished my stair railing so am DONE!!!! WHOO HOO!!!! 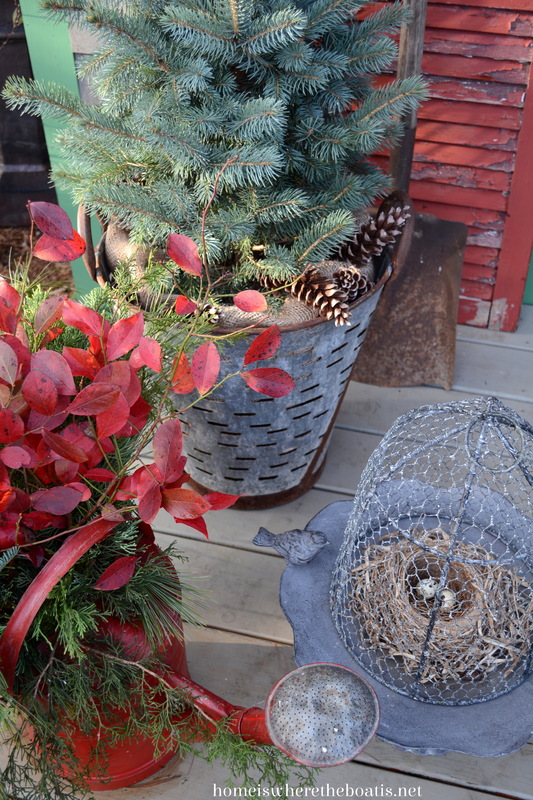 Mary, I so enjoy seeing you transform your potting shed with the seasons! You are so creative; and every detail is always perfect! You have inspired me to spruce up one of the sheds at our country home, and make it a potting shed. You have such great ideas! Mary, the red shutters are fabulous. I love seeing the shed in the field–it’s so beguiling and magical. And inside–filled with Christmas cheer. Your birds, wreath, boots, and the calendar itself. I echo everyone’s comments! Just absolutely awesome!! 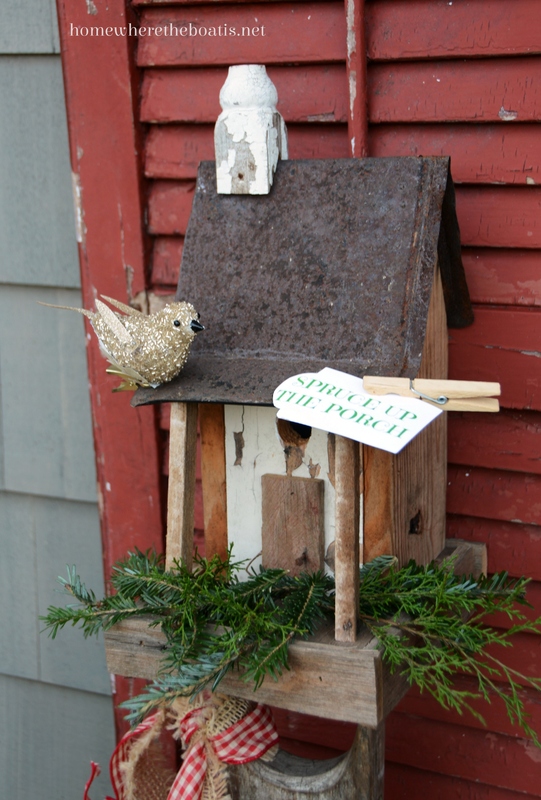 Wish you would come and decorate our house as cute as your pottering shed! Gorgeous! Ok, Mary. 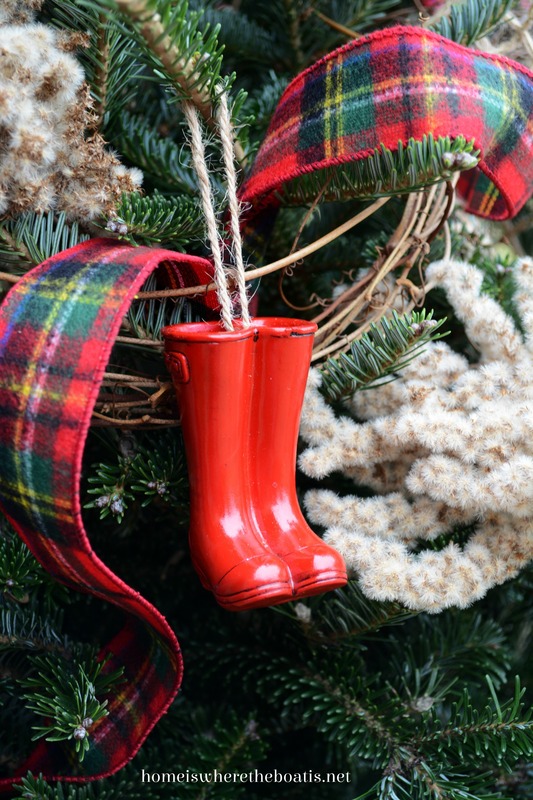 You must divulge where you found the wellies ornament because now that I’ve seen it, I must have it! Those red shutters are perfection on your shed. And I noticed your red watering can. Is that its original color or did you paint it? The reason I ask is because I’m considering painting one of mine. Love it ALL! Mary, I’d rather see your potting shed all dressed for Christmas more than any other place. The Advent Calendar is one of THE most adorable I’ve seen. Thanks for all the wonderful Christmas inspiration! Stop…STOP…please STOP!!!! I just can’t take any more fabulous ideas, Mary!!! 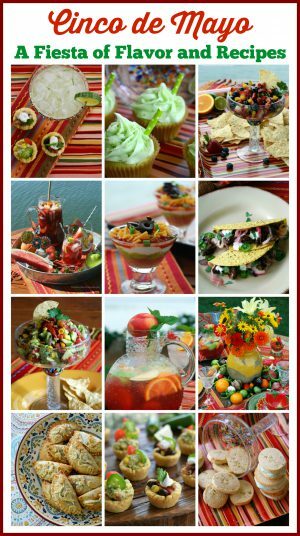 Every single photo brought up another inspiration, another great idea to try to copy (as if!) another wonderful glimpse into your darling world. 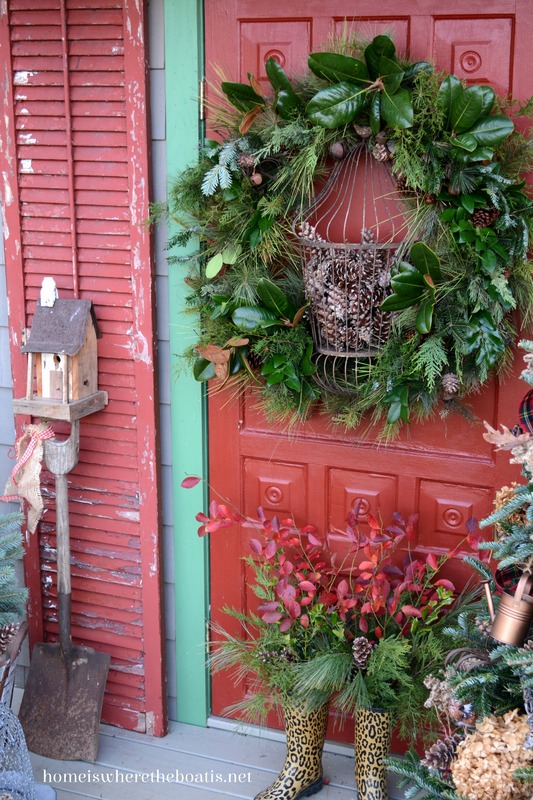 I never would have thought of using an artificial wreath then adding fresh greens to it…brilliant! I adore those cute little red wellies and the leopard ones are fabulous, too. 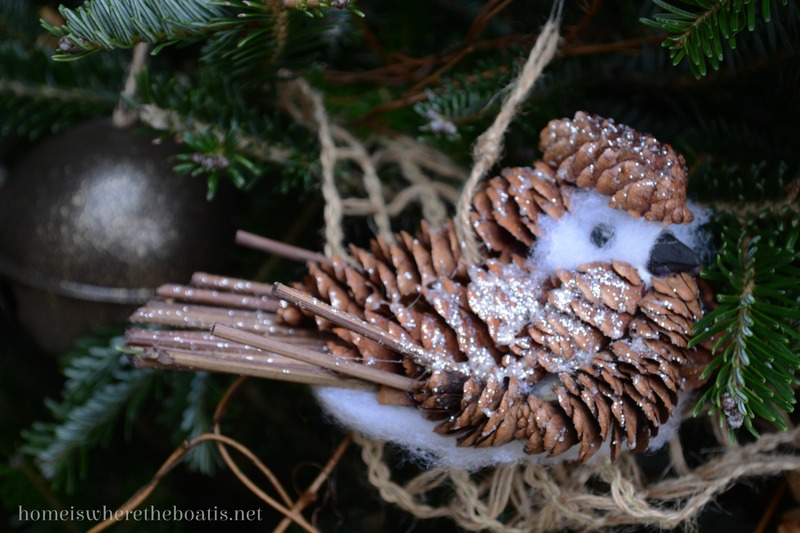 The half birdcage filled with pinecones was a fantastic find…I want to go shopping with YOU! All your precious woodland creatures and creative uses of gardening implements just take my breath away. I’m gobsmacked and I don’t think I’ve ever used that term before…but it fits!!! 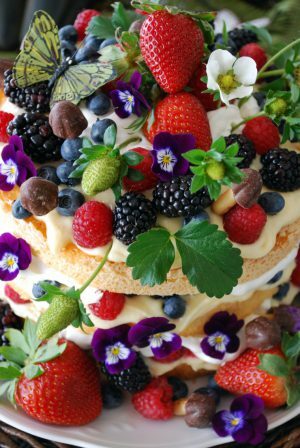 Thank you for sharing such delicious eye candy! Mary, the back porch looks wonderful! It’s fun to see the back of your potting shed. :) I remember reading your post about having to move the shed. That was quite an adventure. Thank you for sharing Mary — visiting from Met Monday. Hope you’re staying warm today! Every detail is divine. You never cease to amaze me! So whimsical and unique! Loved the wellies and bird Advent calendar! Very clever and adorable. Oh my word, how cute and those leopard boots are fabulous. Thanks tons for linking to Inspire Me. I’m inspired! I will have a tree on the back porch this weekend and it will have lots of nature on it. 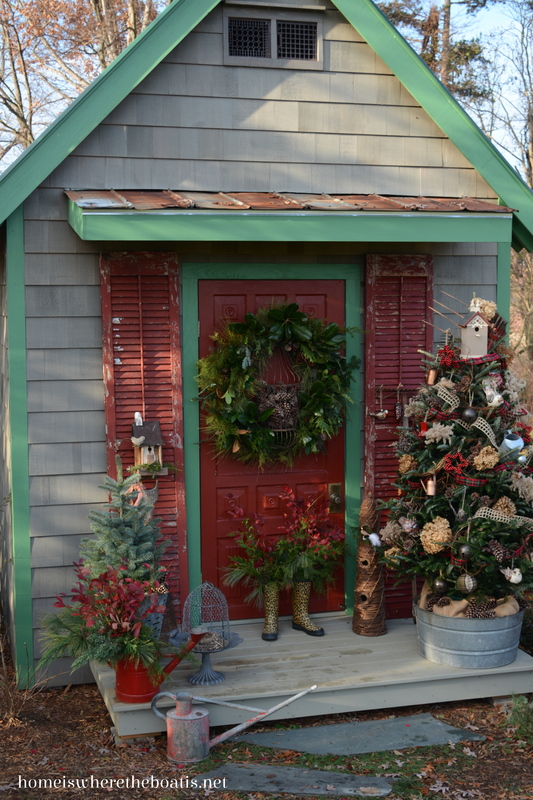 LUV your potting shed and festive attire. so any details to list but the birdcage|wreath & rake w/ ornaments stuck in my head. tfs it’s just lovely. enjoy the season- mj ps. the shutters are perfect. 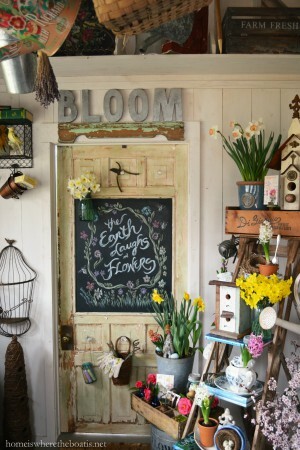 You did an unbelievable job decorating this potting shed! Those red shutters look like they’ve been there for years. The small covered deck outside my back door looks so bare and sad – you’ve inspired me to jazz things up a bit! Adorable! 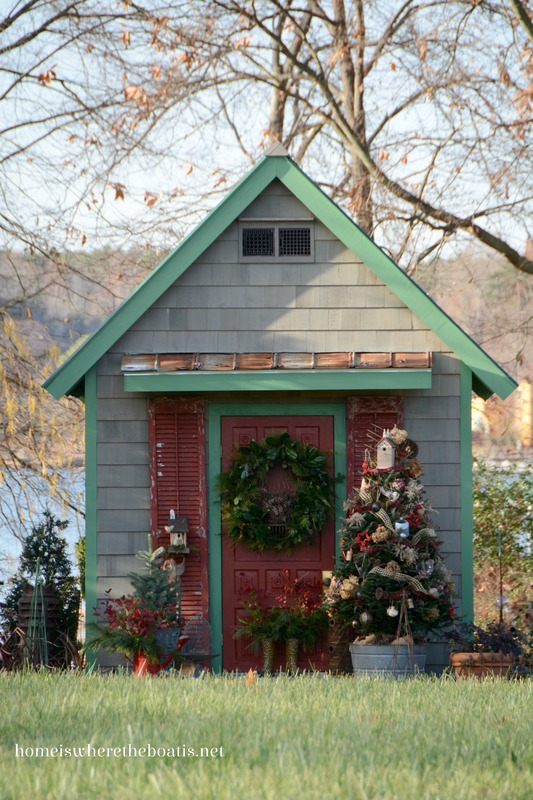 Love everything about your shed decorations…want to come do my porch? Just beautiful Mary! I love the wreath and the advent calendar. Thank you for joining HSH! Have a very Merry Christmas! I’ve pondered my response — you AMAZE me!! Ok! New nickname for you, the Queen Guru !!! You definitely win the prize!!! Your style is stunning! Great job! Love it all!!! !